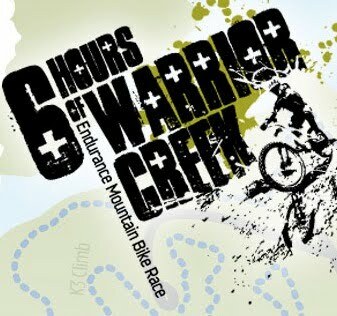 I've been looking forward to the 6 Hours of Warrior Creek race since I raced as a team with a partner last year. This year it was to be solo since I've ratcheted up my training for the Leadville 100. It was not only my first six hour race, but actually my first ride longer than 5.5 hours! Going in I wasn't exactly sure what to expect. I did over-estimate my own speed capability on this particular course somewhat as I thought there was a chance I could do four laps (about 53 miles) in less than the cut-off time of 5:40. But once they posted the exact race route for this year and I found it included several miles of additional course for the start, I was pretty sure I wouldn't make it. And I was right as I ended up finishing four laps with a 6:02:17. That only included one pit stop for just a tad over four minutes in between laps two and three. That overall time was good enough for 32nd place out of 60 riders in Solo Open. I'll be 40 later this year, and had I been in the 40+ age group, I would have improved to a whopping 31st out of 70 riders! Which is to say this doesn't really get any easier as one gets older. To back up and go into more detail, the weekend started with me meeting Alan at Warrior Creek on Friday to pre-ride the new start area and try to figure out where we wanted to setup our pit location. You can't camp overnight at Warrior Creek for this event (camping doesn't open for another week or two), but we knew we'd be back at the gate early enough the next morning to be wherever we wanted, so that was good. We got a nice pre-ride in and got a few questions answered about the course, and felt good about things for the start. While I was sure the pre-race meeting would also answer questions, it never hurts to find out earlier so you can more fully plan how you expect things to go. And then there was the unexpected contingency that we couldn't actually hear any of the pre-race meeting anyway due to not-so-awesome speakers (my only "complaint" about the race, and as such a very minor one, really). Race morning came after a usual bad night of sleep. That's probably part nerves and part just over-active brain wanting to think through everything to make sure I'm as prepared as I can be. And then a big part that I'm not back home in my comfortable bed and am instead in an RV in a Walmart parking lot. But these are things we do in the name of racing. So we got to where we wanted to be for our pit space, got setup, and even had Alan parked and ready to save some space for Michael and Steve, who were driving up race morning from Chapel Hill. But when Michael and Steve showed up, Alan had lost his car keys! Fortunately we were able to get another guy to move temporarily so we could get Michael's truck out of everyone's way, and Alan eventually found his keys, so order was restored. But not after about 20 minutes of desperate searching! Everyone got their gear ready and we headed over to the race start. We sat there through the race meeting that we really couldn't understand (it was a lot like what the teacher on the old Charlie Brown TV cartoons sounded like) and then went to the starting line. We started on time and everyone remembered to start their data (race starts now sound like a fast chorus of Garmin beeps, so it's getting harder and harder to forget it!) and started rolling. It was a long section of road, but it really seemed to go by so fast and then we were on the temporary trail and finally onto the real trail. The start basically put us on the main loop a couple miles "back" up the loop, so on the first lap we exited the race loop and continued straight to start a real full lap. So the first "lap" had an extra three miles or so on top of the normal amount of just over 12 miles. I knew Steve wasn't in his best shape this year, was on about three hours sleep from a week in NYC, and really just hoped to do three laps. But Alan and Michael would be formidable competition since both had recently beaten me at the Doubleshot race (and not to mention the fact that I've never beaten either of them in a race!). So I was really curious after the first lap if either might still be in the pits when I got there, since I was not planning to stop. Unfortunately my first lap got derailed a little bit by a crash. I haven't looked at my data yet to see how much time it cost me, but it probably was only 30 seconds of being stopped and maybe another minute or two of being slow. But the crash hurt. It was about six miles into the race, and I had worked my way into a group that was fairly fast. That said, there were still a couple riders in the front of the group that were causing some accordion effect at the slower technical sections and then a train of folks like me wanting to get around them. But it was going to take some time, because those riders were pretty fast otherwise. Thanks to the accordion effect, I was watching the riders ahead of me more than exactly what the trail was doing and simply missed a small slick spot until it was too late to miss it. I hit it with the front tire while trying to turn to the left just a bit, and my front tire washed out JUST enough that I went down on my left side. And where I fell was right into a section of roots sticking out of the ground. I hit on my left hip and upper left leg (just below the glute) and hit so hard that it really felt like I had to have torn my triathlon tights as well as my skin pretty badly. On top of that, my bike scraped the upper part of my left shin pretty good, too. And then the train of riders behind me almost made it a lot worse (which wouldn't have been their fault!). But somehow they ALL were able to avoid me (I mean I was in a big heap right in the middle of singletrack). I figure about 25 people had to have gone by while I got myself gathered back up. Upon inspection, not only were my shorts not torn, but neither was my leg. The bike looked fine. So I jumped on and took off again. Man, these bikes are built so well these days. And as I pedaled, I could tell my shin was going to burn when I started sweating, and I was definitely badly bruised on my back-side, but it didn't seem like anything that was going to hinder my pedaling. I did need to come down off the adrenalin rush from crashing, but once you've crashed as much as I have, well, you figure that stuff out pretty quickly. And fortunately for me as well, that group of about 25 that went by me was in front of a nice gap on the course and I was able to work back up to speed without being in much traffic again for a while. That was a big help. So I finished that lap, all the while keeping an eye on my power average. It was a little higher than I thought it should be, but not a ton, so I just slowly tried to get it down a little. I felt fine, but I knew just because I felt fine now didn't mean I wasn't burning through energy reserves that I'd need later. As I finished the lap and rolled toward our pit spot, I really hoped I'd see Alan and/or Michael still there, but alas, they had already been there and gone. I planned for only the stop at lap two (and four if I miraculously ended up doing five), so I rolled on through and kept going for lap two. This lap was pretty uneventful, and I did get the power closer to where it should be, though still a little high. I felt like I was drinking and eating very well, and remembered to take my salt supplements on the hour. When I finished this lap and pulled in the pits, I drank a good bit of the water as I rolled in but noted there was still what felt like a few ounces left. Oh, and Michael was in the pits still, but Alan had been there and gone already. Michael was just about ready to leave, and I'd guess that he probably left about 90 seconds into my four minute stop, so he was back about 2.5 minutes ahead. I had some of a PB&J sandwich and headed back out after also swapping more Honey Stinger waffles into my feed bag. At this point I had been out there just over three hours. I felt okay still, but not great, so I tried to take it even easier. Somewhere around half way through this lap (another six miles or so), I started to feel noticeably worse. Still not horrible, but on the decline. Wasn't sure why as everything was going to plan other than a slightly elevated power level (but this was race day, I kept telling myself! ), so there wasn't much to change other than maybe slowing a little more. As I got to mile 8 on this lap, I ran into "Ann from Charlotte." She was chatty, and I'm never one to turn down chatty on the trail, so we talked from that point until the end of the lap. While it was me that caught her, her pace was still very good and so I was fine slowing just a tiny bit more to have someone to talk to (especially since growing up in Charlotte, we had stuff we could talk about). We both thanked one another as we ended the lap for helping pass those miles a little better, but Ann needed to pit for some stretching and I kind of thought I better not stop lest I talk myself into not continuing. I did see that Michael was in our pit, so I rolled through and asked him if he was going out again or not. He said he was thinking about it, but seemed non-committal, so I said good luck and that I was continuing on and kept going. So I knew Steve was still behind me (hadn't seen him all day, but again, no surprise as we didn't figure he'd be able to push four laps anyway), and now I was ahead of Michael, and Alan was somewhere on ahead. Now, I had these visions for about a mile that maybe I could do some pushing and maybe Alan would bonk and maybe I'd catch him. But that was short-lived. I really started to bonk myself. Especially when I realized that I had missed my last salt supplement and was a half hour past it. This didn't happen until near mile six. That didn't seem like a big deal, so I popped one and took a swig to wash it down. I did get a mouthful of water, but noticed I got a little air. WHAT? Tried to take another swig and yes, indeed, I was sucking air. Oh man, I was out of water. Not good! Especially since about two miles later was when the cramps hit. I felt my left calf first, but only mildly. Then my right leg started cramping from the knee to the hip just inside the thigh area. I've never cramped quite like that before! Strangely, even though there were many miles to go, they only caused me to walk two places that were short but very steep hills. Everywhere else I just made sure to gear all the way down and not try to put any big power in. Just spin spin spin at a decent cadence. And breath very well. Before the hill came, breath very well. And happily, it worked. I never had a bad cramp. I did have to slow down a good bit, but that's better than vapor-locking on the trail. I was regularly passing people at this point who were stopped and stretching stuff out against a tree somewhere. All that business about maybe seeing Alan had been long past, so I wasn't surprised to see he had been finished a while when I came in. I was a little surprised to find out that "a while" was actually 25 minutes! That's a pretty good crushing, right there. Had I run my best lap of the day on that last lap, he would have still beaten me by over ten minutes! Oh well, there's still more work to do if I am to beat him in a race. I had to dig deep to do it, but I'm really glad I made four laps. I could tell only a few minutes off the bike that my wound was fairly severe, though. There was no bending at the waist after long, and it hurt. So I got myself in the shower in the RV quickly and got clean and got some compression tights on. I then got packed up and was able to head out of there as soon as we were allowed (once the race was officially over). I iced the area a couple times before getting home, and it was very swollen and a little dark already. By the next day, it was a lot of colors of the rainbow! Plus I was wasted. I was able to eat okay after the race, but didn't want a ton. For the next day and a half, however, I ate like a fiend! And I was still dehydrated at that point, because I've needed more lip balm than at any other point in my life! All in all, I feel pretty good for still being four months out of Leadville. While I wasn't quite as fast as I thought I could be, I'm not really trained very well for this kind of course. I've done most of my training on longer hills since that's what I'll see at Leadville, and Warrior Creek is all very short hills (and a lot of them), which is just way different in how it affects the body. But it still went very well, and so much better than it would have been at any other point in my life, so I'm really happy about that. I owe most of that to hard work, but a lot of it to the kind of intelligent hard work that comes from having an awesome coach, Sage Rountree. Thanks, coach!